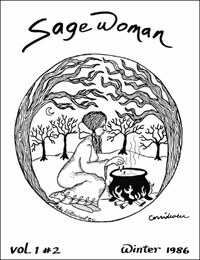 SageWoman #2 Winter's Cauldron (reprint) [sw002p] - $7.95 : BBI Media - Magazines that feed your soul. This issue, published by Carol SheBear in the winter of 1986, is a classic of the early women's spirituality movement. It focuses on women's outrage towards the patriarchy and its excesses, and topics such as women as weavers, Kore's descent, hibernation meditations, feminine Tarot trumps, winter depression, and much more. Articles, poems, letters, and even short fiction, this issue is an eclectic potpourri of the nascent Goddess movement, with contributions from luminaries including Shekhinan Mountainwater, Nan Hawthorn, Judith Laura, and many more. 44 pages.